Home / Why do windows fog up, and what can be done about it? Why do windows fog up, and what can be done about it? You’ve probably seen a window that is so fogged up that you can no longer see through it clearly. You might be the unfortunate owner of one of these windows yourself. Here’s the lowdown on foggy windows. When you look through a modern window, you are looking through more than one pane of glass. These panes are sealed together, leaving a void between them. Sometimes the void is filled with a clear gas such as argon in order to increase the energy efficiency of the glass. Many lower-end windows simply have air in the void. Sometimes the air-tight seal on the glass will break. In the industry, this is called a seal failure. When this happens, it causes any energy efficient gasses to leak out of the glass unit, greatly lowering the energy efficiency of the window. And it allows the humid outdoor air to get inside the glass unit, between the panes of glass. 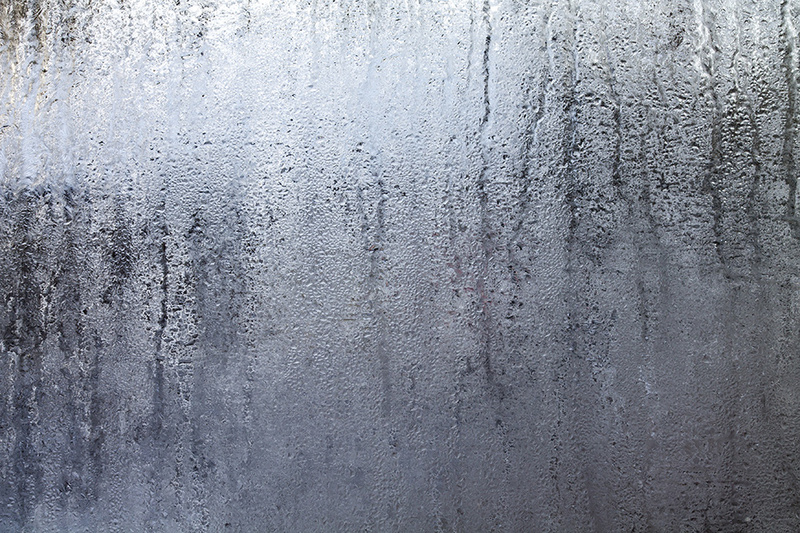 This is what causes the foggy and streaky look – there is actually water inside of your glass. So what can be done about seal failure? The most basic option is to replace the glass in the window. Glass companies can remove and replace the glass unit (the industry term is the insulated glass unit, or IGU). This keeps your existing window frame in tact, which is the least expensive way to fix the problem. However, this does not get to the root of the problem. There is a reason the seal failed in the first place, and this reason is often related to the pressure that your window frame puts on the glass unit as it goes through natural expansion and contraction cycles. A window that has had a seal failure once is liable to have a seal failure again – so your problem might not be going away for good if you only replace the glass unit. The best option is to replace the entire window, including the frame. This is more expensive, which means that there are situations where it is not reasonable, such as if your house is for sale and you need a simple fix. But if you are planning to live in your home for a while, there can be great benefits to knocking this fogged-glass problem out once and for all. By replacing the entire window with a window that is manufactured to prevent seal-failures, you can ensure that your glass will never fog again while also reaping all the energy efficiency and aesthetic benefits that come with premium quality windows. How can I know if a replacement window is manufactured to prevent seal failures? There are several manufacturing processes that need to take place in order to prevent seal failures. Most replacement window manufacturers do not use all of these processes. Kelly Window and Door does on vinyl windows and on many wood windows. A stainless-steel spacer needs to be used rather than rubber or aluminum, because rubber is more prone to separate from the glass and aluminum is very bad for energy efficiency. This rules out the majority of replacement windows on the market. The glass needs to be edge-deleted – a technical process for ensuring that the spacer between the panes of glass is adhered directly to the glass and not to an intermediate film, which is more prone to separate and cause seal failure. This rules out even more windows. The good news is that Kelly Window and Door’s vinyl windows come standard with stainless-steel spacers, edge-deleted glass, and lifetime seal-failure warranties. Our seal-failure rate has always been low. In recent years we have pulled that rate even lower by using manufacturing partners who employee these processes. And in the rare event that one of these windows does experience a seal-failure, replacement is completely covered under warranty. So will Kelly Window and Door just replace the glass, without replacing the entire frame? No – we specialize in full window replacement. We recommend full replacement if you have no plans to move out of your home in the next few years, as this will be a very beneficial upgrade to your home. But if you are planning to move soon, or if you do not want to spend the money on full replacement right now, we can direct you to a few local glass shops as well. We want to be a resource to you one way or the other. When you’re talking to us, be sure to ask us about seal-failure if you are interested in more information on this topic. Our job is to provide the solutions that are best for you and your home, and we are always happy to answer all the questions that arise when going through that process. The first step is calling our office at 919-461-0010 to schedule a consultation, either in your home or in our showroom. We can’t wait to make your windows clear again.